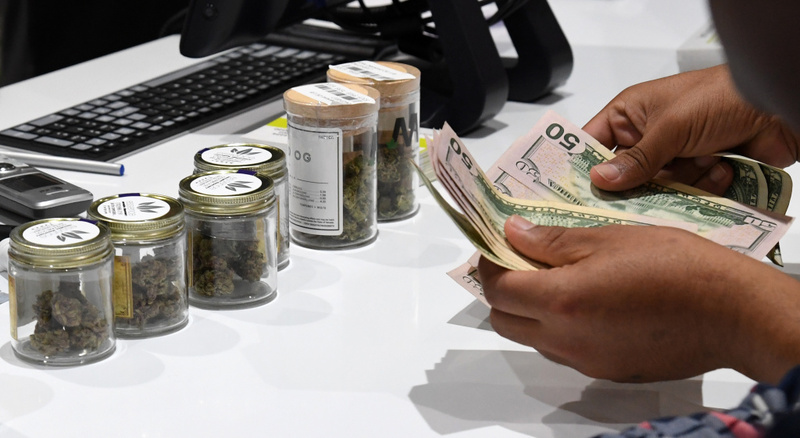 A customer pays for cannabis products at Essence Vegas Cannabis Dispensary after the start of recreational marijuana sales began on July 1, 2017 in Las Vegas, Nevada. 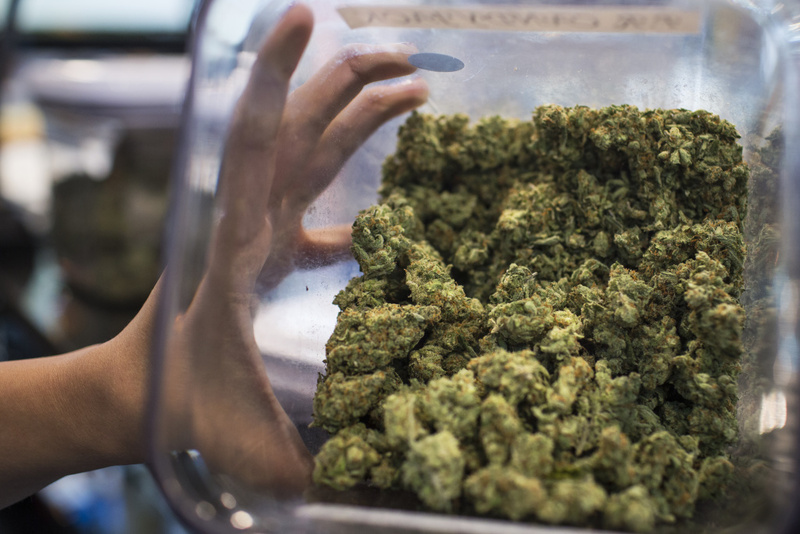 California's legal marijuana marketplace is coming with a kaleidoscope of new taxes and fees that could influence where it's grown, how pot cookies and other munchies are produced and the price tag on just about everything. At the high end, that's about a 70 percent jump. David Burr removes leaves on marijuana plants to allow more light for growth at Essence Vegas' 54,000-square-foot marijuana cultivation facility on July 6, 2017 in Las Vegas, Nevada. "All it would become is compost," predicted Ryan Jennemann of THC Design in Los Angeles, whose company has used the leaves to manufacture concentrated oils. 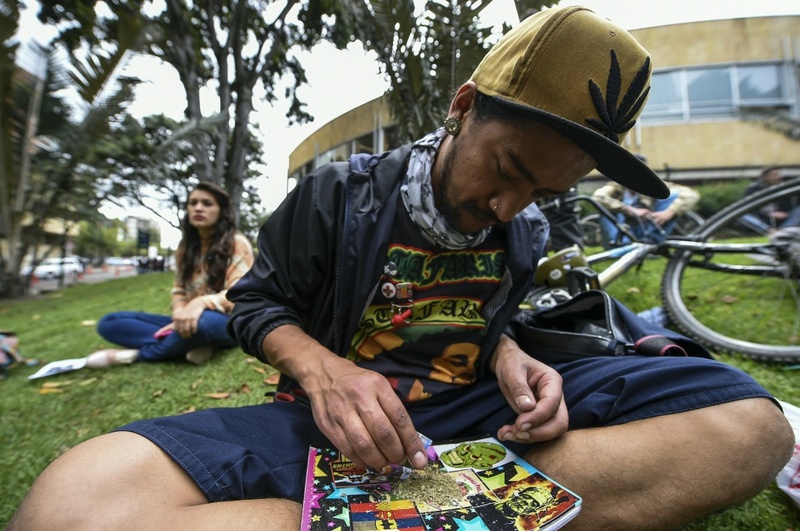 An activist in Bogota, Colombia rolls a joint under the motto "No vamos a pagar, lo vamos a pegar" ("We are not going to pay for it, we are going to get the kick out of it"), part of a protest against fines for smoking marijuana on August 1, 2017. 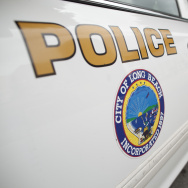 But higher taxes for businesses and consumers give the state's thriving illicit market a built-in advantage. Operators in the legal market have been urging regulators to be aggressive about shutting down rogue operators. 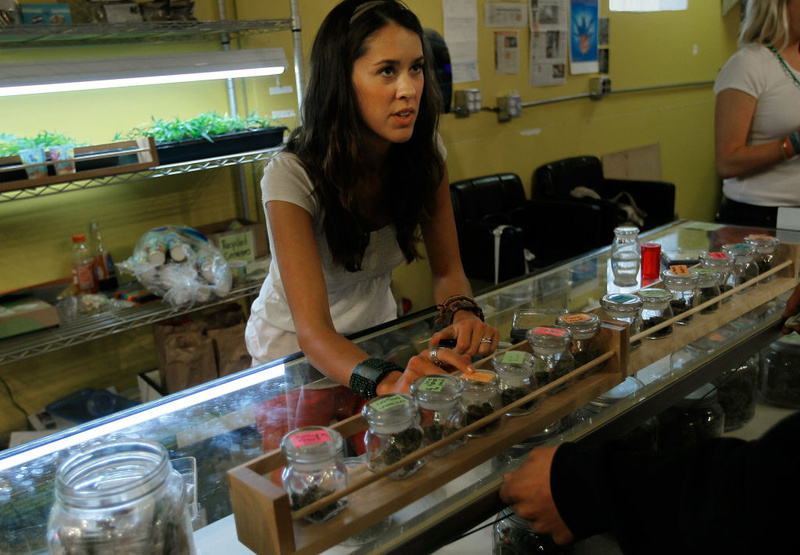 Marijuana saleswoman Marissa Dodd talks to a customer about different varieties of marijuana available at the Dr. Reefer marijuana dispensary April 20, 2010 at the University of Colorado in Boulder, Colorado. Donnie Anderson, a Los Angeles medical cultivator and retailer, predicted the higher level of state taxation next year is "just going to help the illicit market thrive." He said more needs to be done to cut the cost, especially for medical users, many of whom won't be able to absorb a price jump. 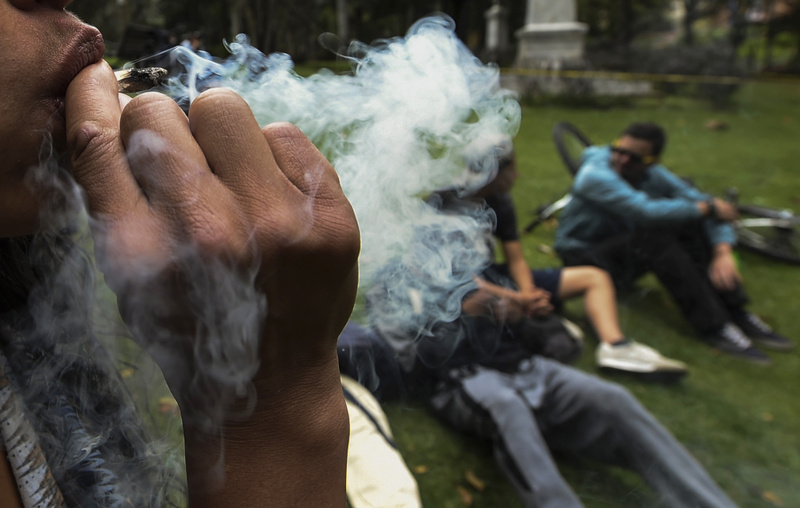 The increased tax rates are just one part of California's sprawling plan to transform its long-standing medical and illegal markets into a multibillion-dollar regulated economy, the nation's largest legal pot shop. The reshaping of such an expansive illegal economy into a legal one hasn't been witnessed since the end of Prohibition in 1933. 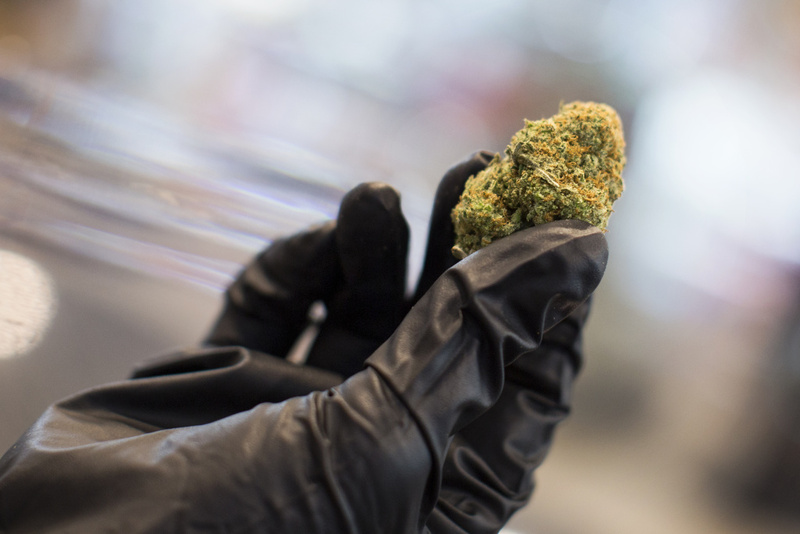 An employee holds one of several strains of medical marijuana sold at a dispensary in downtown Los Angeles on Monday afternoon, Feb. 29, 2016. 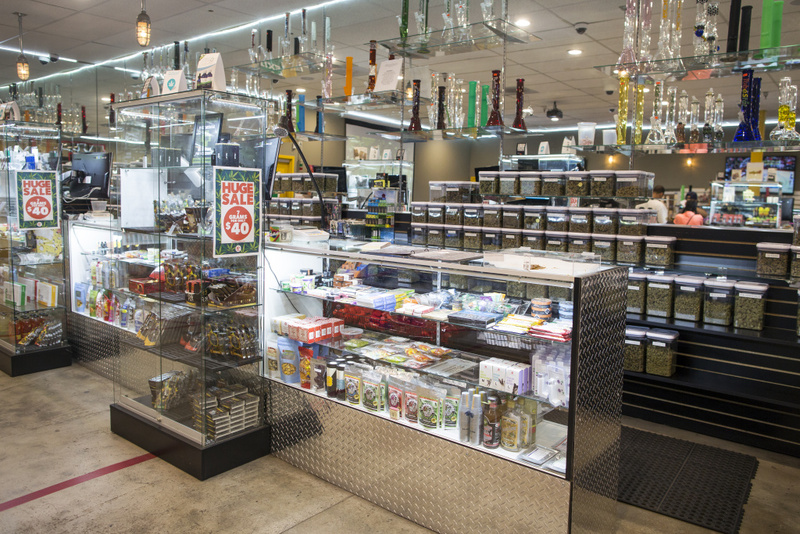 Kushmart is one of the largest medical marijuana dispensaries in downtown Los Angeles. 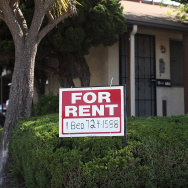 In the agricultural hub of Salinas, southeast of San Francisco, voters approved a tax that will eventually rise to $25 a square foot for space used to cultivate the leafy plants, a rate that's equivalent to about $1 million an acre. 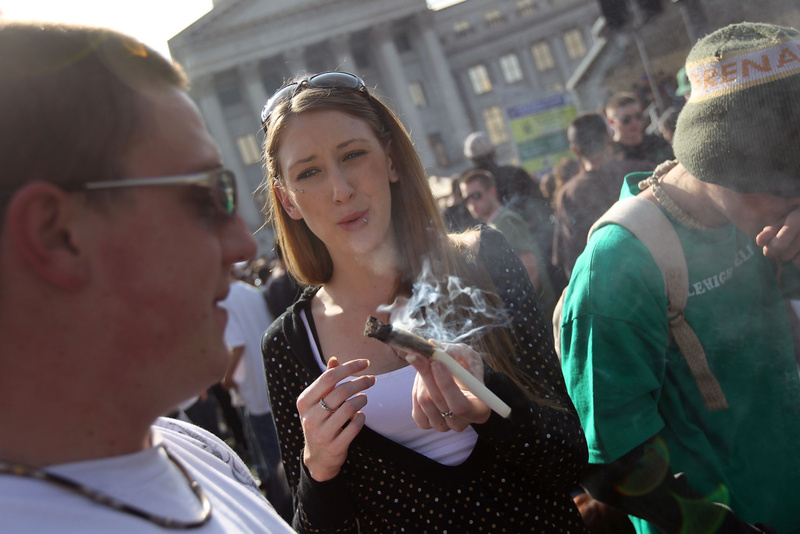 A woman passes a joint at a pro-marijuana "4/20" celebration in front of the Colorado state capitol building April 20, 2010 in Denver. 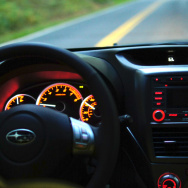 "A high tax rate, that would be one more barrier to getting people regulated," he said. 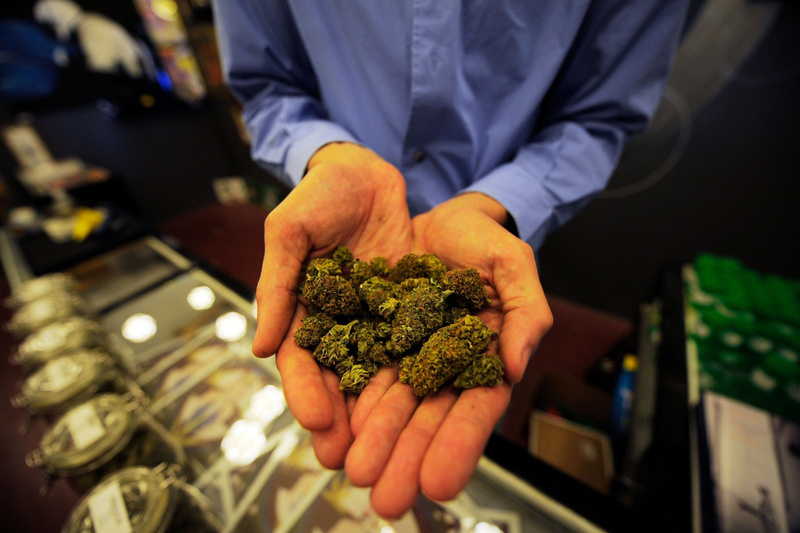 Tim Blakeley, manager of Sunset Junction medical marijuana dispensary, shows marijuana plant buds on May 11, 2010 in Los Angeles, California. As for medical, the city tax would be lower, 5 percent, but retailers say that's sometimes not passed on to the consumer. 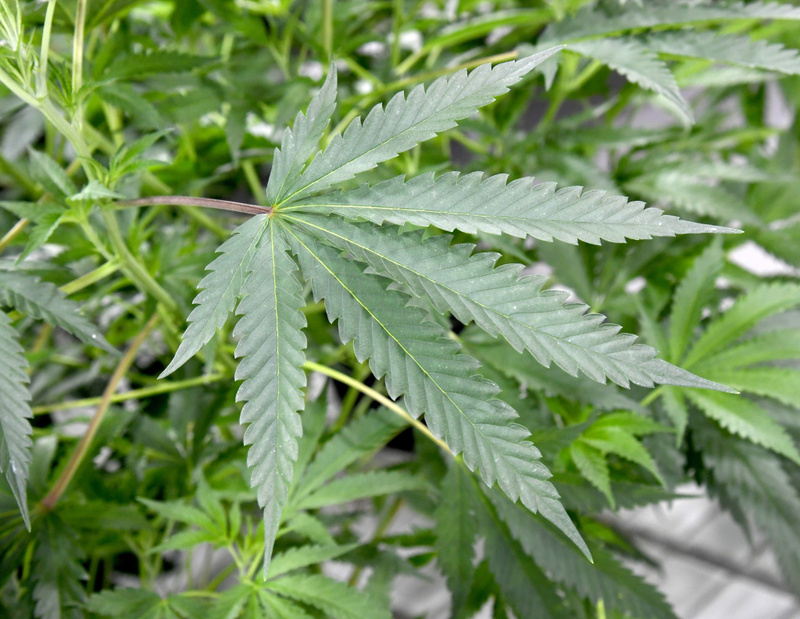 Consumers with a valid medical marijuana identification card would not pay sales taxes. 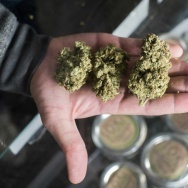 "The existing black market for cannabis may prove formidable competitor to legal markets if new taxes lead to higher prices than available from illicit sources," the report warned. 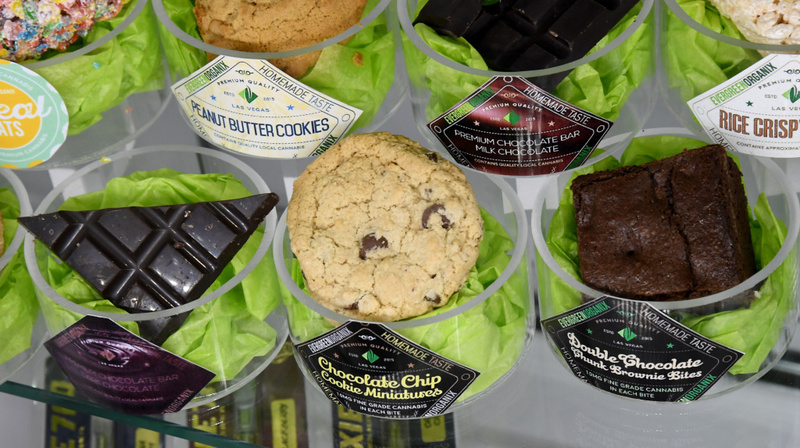 Edible cannabis products are displayed at Essence Vegas Cannabis Dispensary before the midnight start of recreational marijuana sales on June 30, 2017 in Las Vegas, Nevada. "While our members, like any other business sector, would like to see a lower tax rate, we have not seen any evidence that current tax rate is diverting people into the black market," Aaron Pickus, a spokesman for the Washington CannaBusiness Association, an industry group, said in an email. 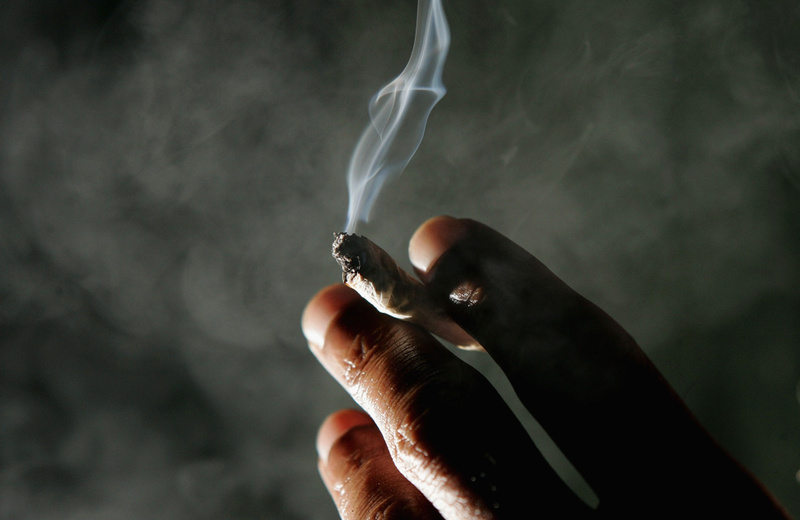 Jonathan Beaver of San Francisco holds a marijuana cigarette at the San Francisco Patients Cooperative, a medical cannabis cooperative, November 29, 2004 in San Francisco, California. 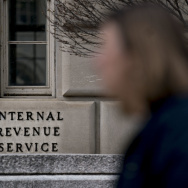 "When you add to that high tax rates, you increase the number of reasons why someone might not be able to become regulated," she said. 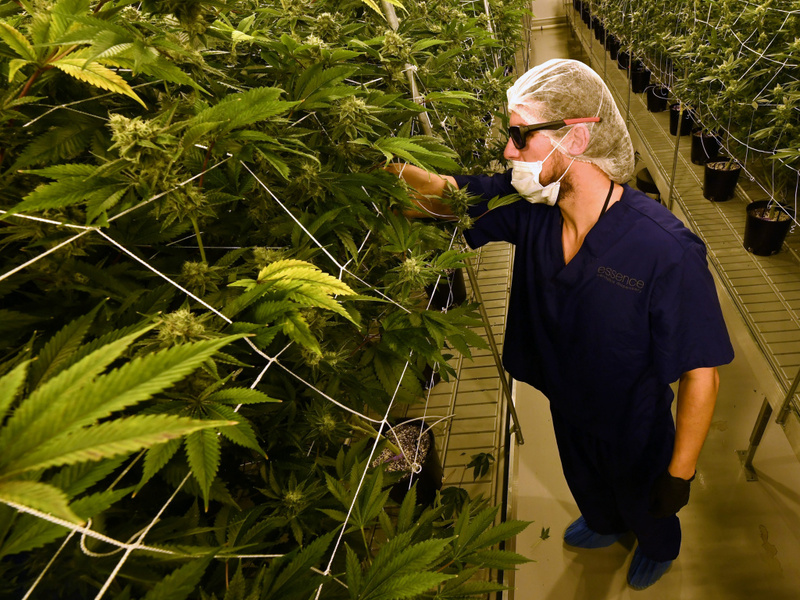 Marijuana plants are grown at Essence Vegas' 54,000-square-foot marijuana cultivation facility on July 6, 2017 in Las Vegas, Nevada.